The tour that has featured all-star lineups in the past has made its comeback. The Where’s The Band? tour has made an official announcement today with a new lineup of musicians that will be hitting the road with just their acoustic guitars. 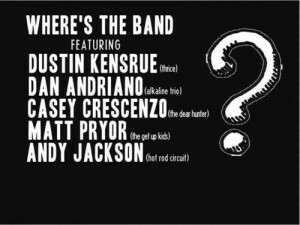 The bill includes Dustin Kensrue (Thrice), Dan Andriano (Alkaline Trio), Casey Crescenzo (The Dear Hunter), Matt Pryor (The Get Up Kids), and Andy Jackson (Hot Rod Circuit). The shortened tour will be featured primarily on the West Coast during the week before Christmas in December, beginning in San Francisco, CA at the Great American Music Hall and finishing in Pomona, CA at the Glass House. Check out the dates below after the jump and be sure to make these shows a priority when the tour is near you.